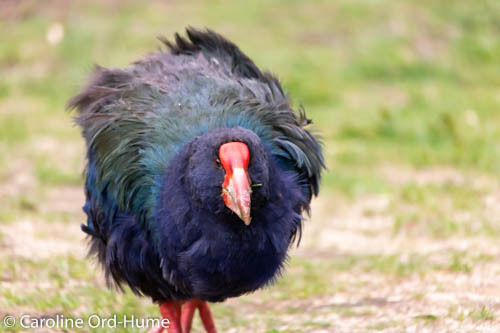 The New Zealand South Island Takahē birds are rare, vulnerable and flightless. Takahe is one of the rarest remaining flightless bird species that were once common across New Zealand. These precious birds had been considered extinct until they were discovered to be surviving in the Murchison Mountains in 1948, in a remote Fiordland valley. Right up to the 1980s the surviving birds carried on living hidden away in the depths of Fiordland but since that time some were relocated to 7 island sanctuaries and others to dedicated conservation sites on the mainland. New Zealand Takahē bird with its lightweight colourful feathers blowing around in the wind. Takahē are endemic to New Zealand. They are from the same Rellidae family as, and look similar to, Pukeko. 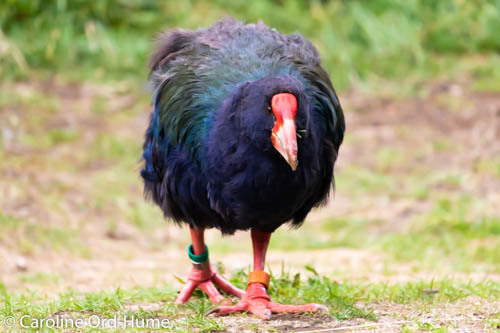 Pukeko are distinguishable from Takahē as they are lighter weight and taller, although Takahē often get called Pukeko by mistake due to the same overall colouring and appearance. Originally there were two Takahē species but the other, the North Island Takahē, moho, has been extinct since the latter 19th century. Takahē birds prefer a grassland habitat where they can also access use of shrubs for shelter. The alpine tussock grasslands of Fiordland National Park are ideal for these birds and in Fiordland they can find shelter in beech forests when the winter snows cover the ground. Although they do spend time in forested areas for protection during winter, they prefer grassland with shrubs. Originally these flightless birds would have been throughout the South Island but due to various factors such as loss of habitat, predation, and hunting, they have been very lucky to survive confined to a remote valley in the Murchison Mountains area of Fiordland. Takahē could so easily have become another extinct species. Captive breeding facilities such as Burwood Bush, Te Anau, have contributed to maintaining the survival of this unique species, along with free roaming populations on wildlife reserves and islands such as: Tiritiri Matangi and Motutapu at Hauraki Gulf, Kapiti and Mana Wellington, and Maud in the Marlborough Sounds. South Island Takahē have deep blue feathers around their head, neck, and under their body. Their back and wing feathers are olive green, and they have white feathers under the tail. 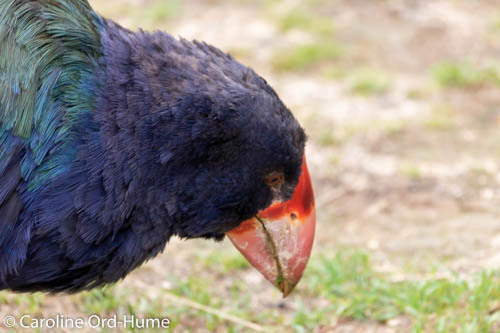 Takahē birds have a huge red bill that runs from the forehead between the eyes and pales in colour towards the tip. South Island Takahē legs and feet are red, chunky looking and stout. Juvenile Takahē has duller plumage and colour until maturity with pinky brown legs and feet and more of a black/orange bill. Species that are similar are the Pukeko and the North Island Takahē, the latter being extinct. 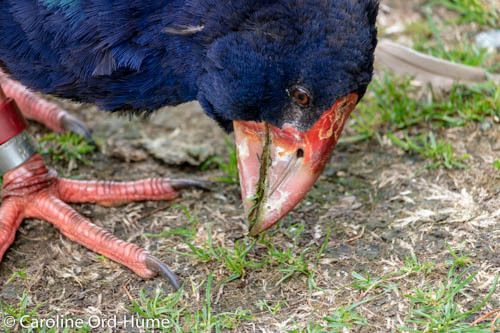 The differences in the Pukeko for identification purposes are that Pukeko are able to fly whereas Takahē are flightless. 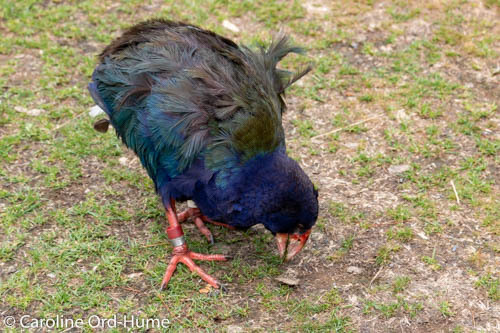 Pukeko are smaller and slimmer in body, their legs are longer, and they have wing and back feathers that are black. Just the height and leg length is enough to tell the two species apart even though they do look very similar because of the blue colouring, the red legs, and the red beak. 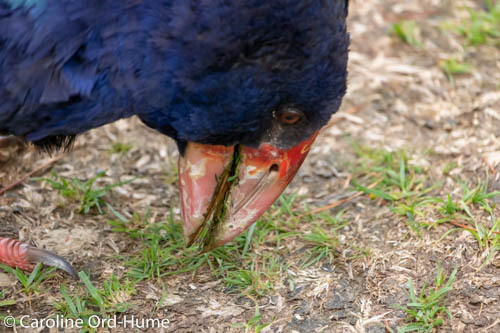 Takahē feed on grasses, sedges, and rushes. Depending on what’s available at sites at different times of year, they will also eat grass seeds and fern rhizomes (Fiordland). They may sometimes also eat large insects such as beetles, moths, and weta. The Department of Conservation Takahē Recovery Programme, along with community groups and Mitre 10 Takahē Rescue, have a long term aim to ensure the treasured South Island Takahē species survival and return them to their original environment where possible. Learn more about the programme in the references at the bottom of the page. The natural range of Takahē in the wild is confined to Fiordland National Park. However, due to translocations, captive breeding programmes, wildlife reserves, sanctuaries, and stoat control, the population of these unique flightless birds has been gradually increasing. The total population was estimated to be around 350 in 2017. Threats to survival include; predators such as stoat, and competition for grazing from deer. The Takahē photographs on this page were taken at Zelandia. 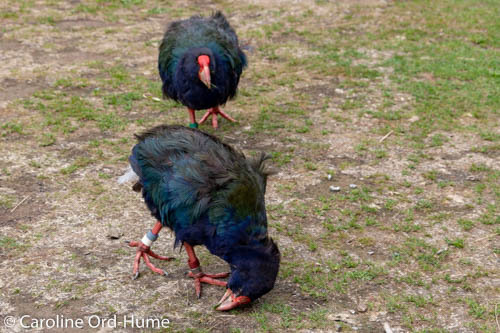 There is a breeding pair of South Island Takahē at Zelandia in Wellington on the North Island, named Nio and Orbell. Nio and Orbell can usually be seen near the lower lake where there are wetlands, foraging for food in the sedges and rushes. They are grazing on a grassy area where there wasn’t actually much grass to be had because there had been a really hot summer and the ground was pretty bare but the breeding pair of Takahe were managing to find some bits of grass to eat. Takahē in captivity such as Nio and Orbell are good ambassadors for conservation of these birds in New Zealand as most people wouldn’t otherwise be able to see these rare flightless bird species. Although there are some Takahē birds in the wild, the likelihood of spotting them in a remote mountain reserve, or offshore island, is pretty slim. Zelandia Urban Ecosanctuary is an excellent place to spend the day lots of native New Zealand birds to see, including the fascinating Kaka.